Adding a flash of color to the Black Label series, the new EFR516PB series utilizes luminescent orange and green hour indexes set against a gloss black texture dial. 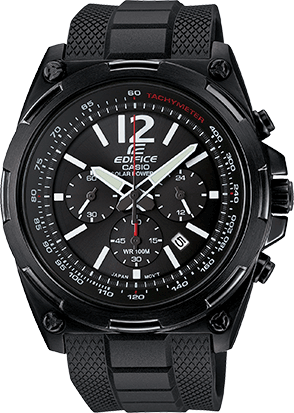 A 1/20th Chronograph measures elapsed time and the Tachymeter can be used to measure speed over a measured mile/kilometer. Black resin band analog watch with black face.